Cat Cat village is a Hmong settlement and about 3 kilometers away from Sapa. The Hmong in Cat Cat village still live in more or less the same way as their ancestors a thousand of years ago. To visit Cat Cat Village, you walk through Sapa Market down the valley. Visitors to Cat Cat Village can discover countless unique features of H'Mong people. Trekking Tour to Cat Cat Village in Sapa. Waterfall in Cat Cat village very Beautiful. Cat Cat Village is far from the center of Sapa town around 2km by trekking or motorbike. Cat Cat Village was established by the H’Mong ethnic group and it is located under the Hoang Lien Son Mountain and the mighty mountain top of Fansipan. Cat Cat Village is a place where the culture and nature of the minority ethnic groups is mixed, it is very neglected and traditional. 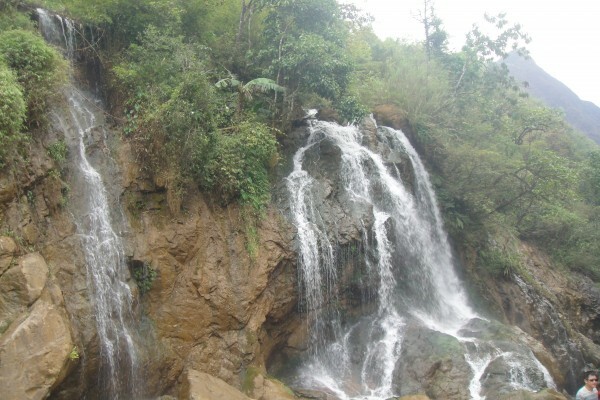 This is an exact destination for the tourists who want to discover the mountainous nature, people as well as prefer to leave a busy life in the city to relax in a fresh area as in Cat Cat Village, Sapa. Although the tourist must trek to go to Cat Cat Village, this trekking trip completely do not make any tourist to feel tired because the weather is very cool as well as the wonderful landscape at two sides of the trekking road will make the tourist forget tired. Each step you trek, you will see the traditional houses and people at here, the children and local people are very pool but they are very friendly with any tourist, there are a lot of the local people could speak English because this village was developed about the tourism for a long time ago. Specially, the local people in Cat Cat Village has their own traditional handicrafts such as carve silver, weave fabric….The tourist could see directly the locals at here to do these things while trekking in Cat Cat Village, then the tourist also should not miss to buy some special souvenirs which are made directly from the silver and cloth by the locals at here, it is very real, beautiful and cheap. The most famous feature in Cat Cat Village is waterfalls, these waterfalls at here flows everyday, but it is nicer in the raining season because there will have a lot of water in this season. Arrival to Cat Cat Village, you also will be seen and listened the traditional musics and songs of the locals at here, this show is organized every hour and it is free. Trekking to Cat Cat Village, the tourist also will see a lot of the small and poor children on the trekking roads, so that if it is convenient for you is you should bring some candies while trekking in this village to give it for the poor children at here, it makes sure that they will be very surprised and glad about your kind action.